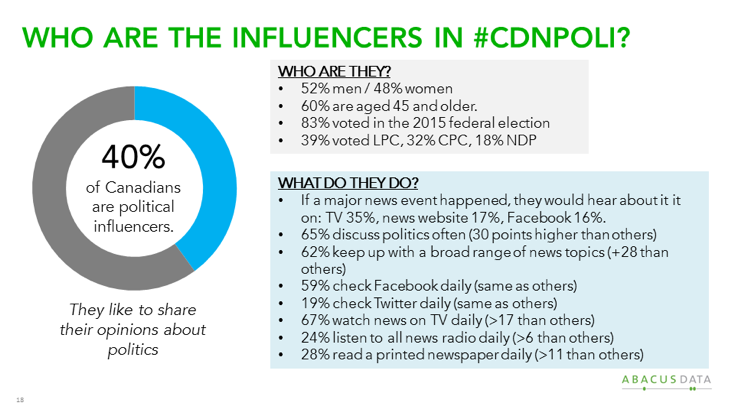 In August 2016, we explored how Canadians use the internet to discuss and debate politics, get their news, and what role Facebook plays in our news habits, opinions, and participation in public affairs and public policy. We collected 60 pages of data and learned a lot about these topics and how they breakdown by age groups, gender, political ideology, education, and communities. In this document, we share our TOP 8 TAKEAWAYS from the survey data. Given what has happened in the recent months – Brexit, Trump, debates about the role of government intervention in the news business, the rise of fake news and the emergence of alternative facts – we believe public affairs professionals, those looking to influence public opinion or public policy, and those just interested in politics will find these takeaways valuable and actionable. If you’re interested in learning more about the data we’ve collected and our thoughts on how it applies to your work, please get in touch with us. 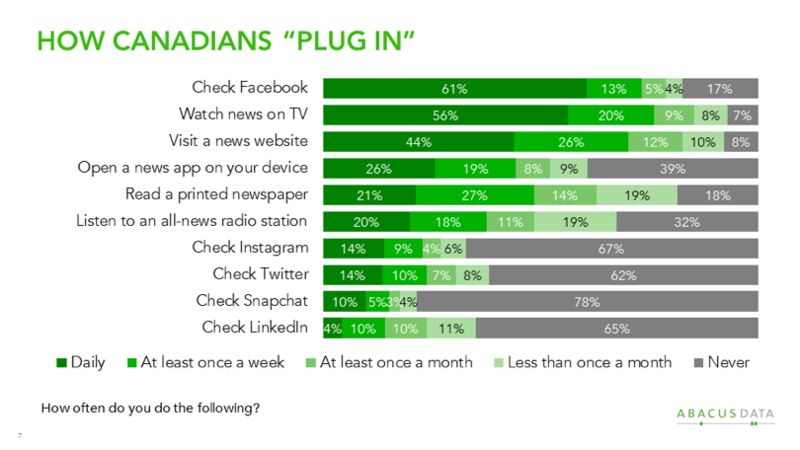 OBSERVATION: Social media’s status as a primary source of news and information for Canadians has more than doubled in two years. 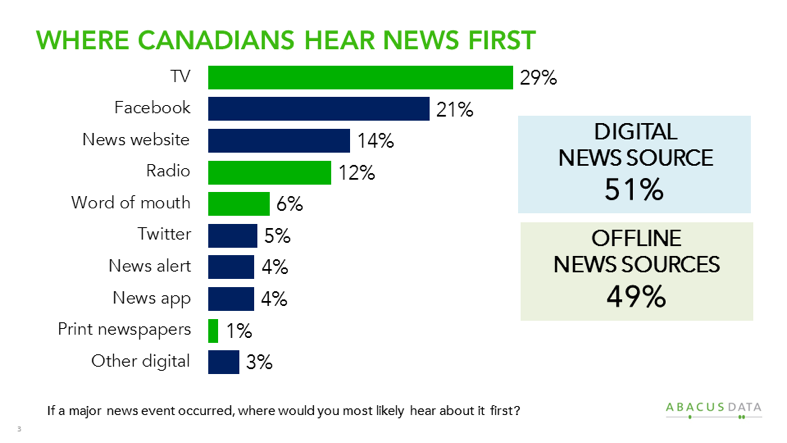 In fact, Facebook is closing in on television as the breaking news source for Canadians and is already the leading source among those under 45 years of age. Twitter remains an important source for a small yet influential group of Canadians who regularly serve as credible sources of information and opinions for journalists and media organizations. Digital news consumers (those who get their breaking news from online sources) tend to be younger (62% are under 45 years old) and are much more likely to check social media sites like Facebook, Twitter, and Instagram. 17% do not have a cable or satellite TV subscription at home and they have, on average, 5.8 devices connected to the internet. Offline news consumers are generally older (69% are aged 45 and older) and are less likely to check social media sites. However, half still check Facebook at least once per day. They are more likely to have a paid TV service and they connect fewer devices to the internet. Although generation is the primary driver for different news consumption behaviour, the relationship is not perfect. 38% of digital news consumers are 45 years old and older while 31% of offline news consumers are younger than 45 years old. Of greater significance is the shifting behaviour we have captured in the years we have been measuring news consumption since 2014. UPSHOT: News almost always breaks on Twitter before fanning out to Facebook, online news sites, and the broadcast media. Breaking news and commentary are energized by a hyper-connected, hyper-aware cohort in every imaginable interest. Tweets typically have a short shelf-life before the story lands on Facebook where a newsfeed algorithm is designed to keep users on Facebook, interacting with the stories that most interest them. It’s a hamster wheel of interaction that keeps stories relevant for longer periods of time. More interestingly, we are moving toward a world of passive news reception where the news and information we consume is determined more by what others in our networks share and the decisions we have made to curate our own newsfeeds than by editorial decisions in newspaper or broadcast TV newsrooms. 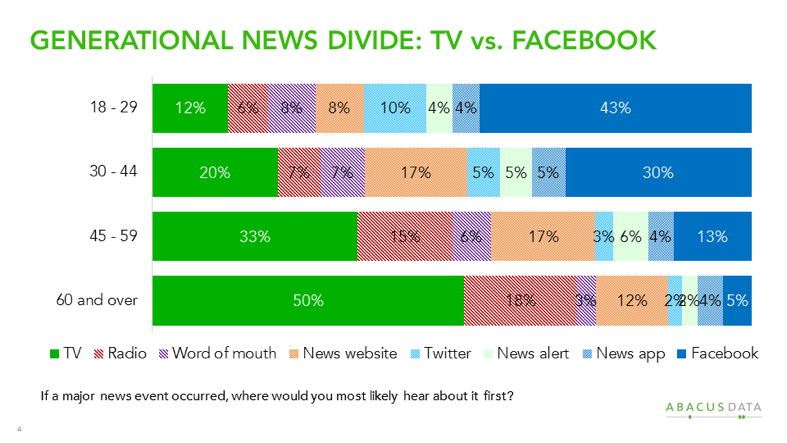 Offline breaking news sources are being eclipsed by digital news sources as generational disruption and widespread use of social media and mobile technology radically alters the news and information landscape. The change we are witnessing is moving so quickly that we anticipate within another five years, how Canadians consume news and information will look nothing like it did two decades before. A quick look at historical data shows that it took more than 30 years for 50% of the population to adopt radio as a primary source for news and information. Mobile phones took only 15 years to reach the same level, and social media, a mere 3.5 years. OBSERVATION: More than half of Canadians (61%) check Facebook at least once a day. An additional 13% check at least once a week. 49% of those 60 and older check Facebook daily. 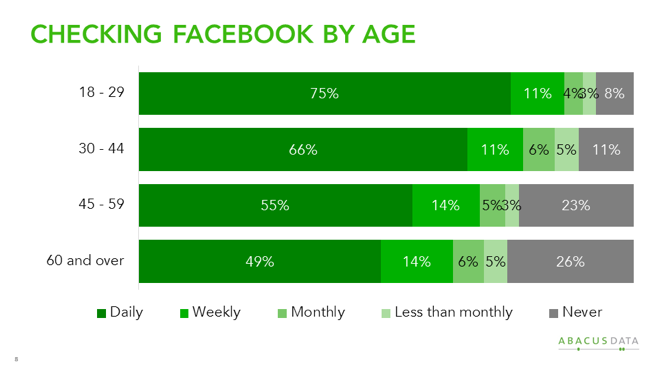 That share increases for younger generations with 75% of 18 to 29-year-olds checking Facebook daily. In contrast, 56% watch news on TV daily, 44% visit a news website daily, and 21% read a printed newspaper daily. 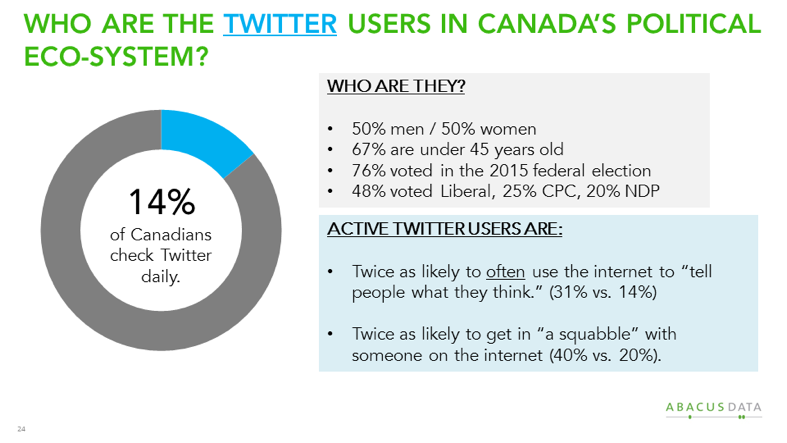 14% of Canadians check Twitter at least once a day. 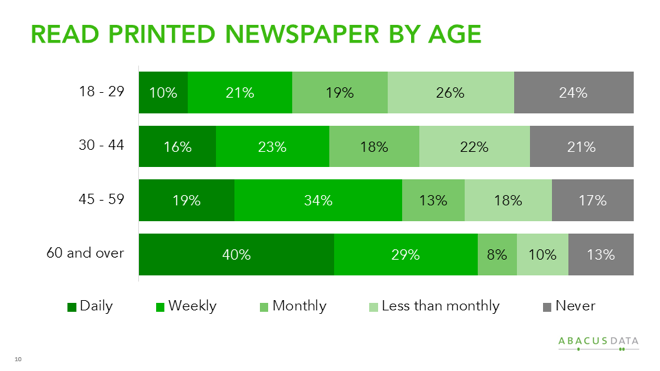 While 40% of those aged 60 and over read a printed newspaper each day, that number falls to just 10% of those aged 18 to 29. The story about Facebook is not just about how often Canadians use the platform but how they use it. 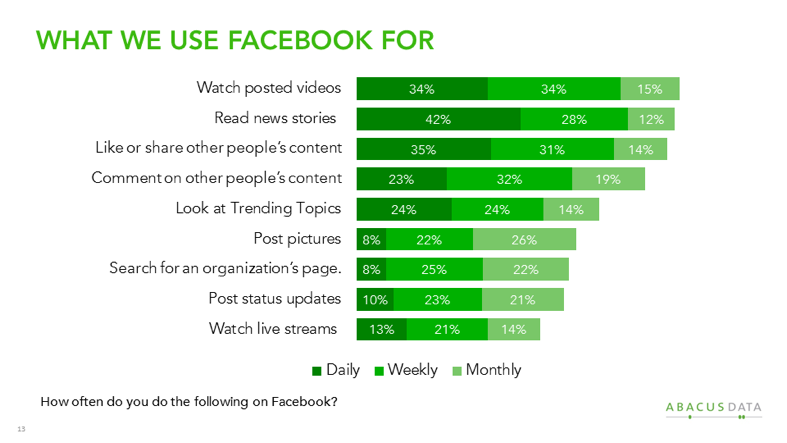 Every day, at least one in three Canadian Facebook users watch videos, read news stories or share other people’s content on the platform. A majority report doing those things at least weekly. Facebook is not just about posting pictures, it’s a dynamic platform that many Canadians use to consume content, share their thoughts and comment on other people’s posts. It’s an interactive ecosystem ripe for political discussion and persuasion. A place where public affairs professionals can speak to a broad group of citizens or to a very specific segment. It’s this multi-functionality that makes Facebook so addictive for users and so appealing for marketing ideas, services, and products. UPSHOT: Facebook continues to increase its share of market and it’s not just younger Canadians who are using the social media network. The ability to target advertising and messaging continues to improve and with a so many Canadians actively using the platform, any organization—large and small—can take advantage of its incredible reach. If you want to get a story or opinion in front of a Canadian audience, you need to make sure you’re making it available to consumers in an attention-getting and engaging way on Facebook. If we had told you in 2005 (the year Facebook was launched in Canada) that about six in ten would check the site at least once every day only a decade later, you wouldn’t have believed us. Facebook should be a major part of every public affairs professional’s toolkit. 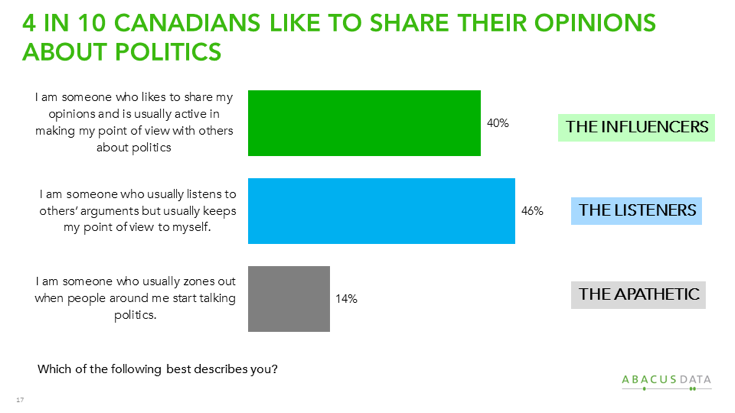 OBSERVATION: Despite popular belief, young Canadians are more likely to participate in discussions about Canadian politics and current events than any other age group. 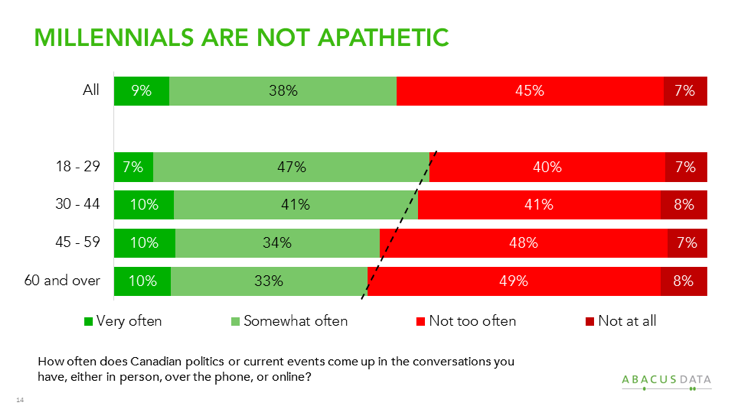 Most of those aged 18 to 29 regularly engage in discussions about Canadian politics and current events. That’s 11-points more than those aged 60 and over, the group that’s least likely to engage in those conversations. OBSERVATION: Canada’s most active Facebook users tend to feast on a diet of news and information that is catered specifically to their interests, values, and ideologies. The more active Canadians are on Facebook, the more limited their world view. 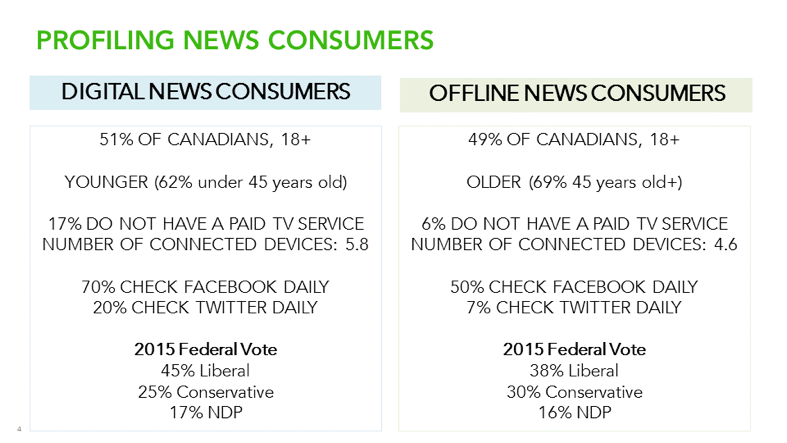 While Facebook is the primary breaking news source for 75% of younger Canadians, only 28% of that group report following a broad range of topics while 51% pursue only what interests them. Older age groups are more likely to keep up with a variety of topics including 40% of 30-44-year-olds and 62% of those 60 and over. UPSHOT: Facebook’s algorithms are designed to cater news and information to each user’s unique interests to increase the likelihood of keeping the user engaged on the site for longer periods of time. The resulting reliance on Facebook as a primary source means users are getting a limited world view and a limited set of opinions that most closely match their own (confirmation bias). To get messages and stories to reach a wider untapped audience, organizations need to be creative with organic online activities and clever with paid online activities. 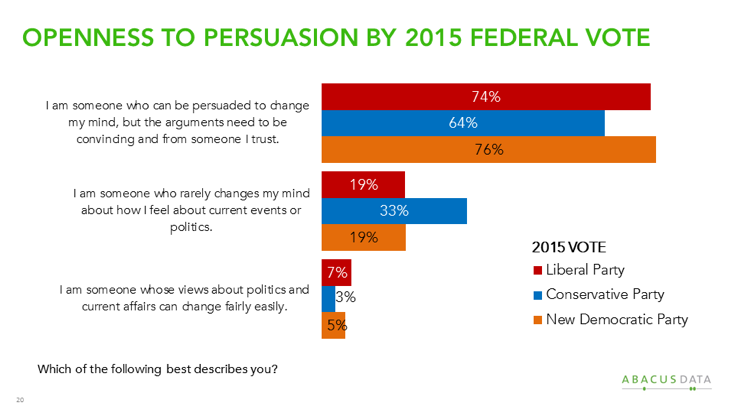 OBSERVATIONS: Over four in 10 Canadians maintain that they are willing to change their mind if someone they trust uses persuasive arguments. Moreover, the data indicates that four in 10 are potential influencers – those who describe themselves as people who like to share their opinions about politics. 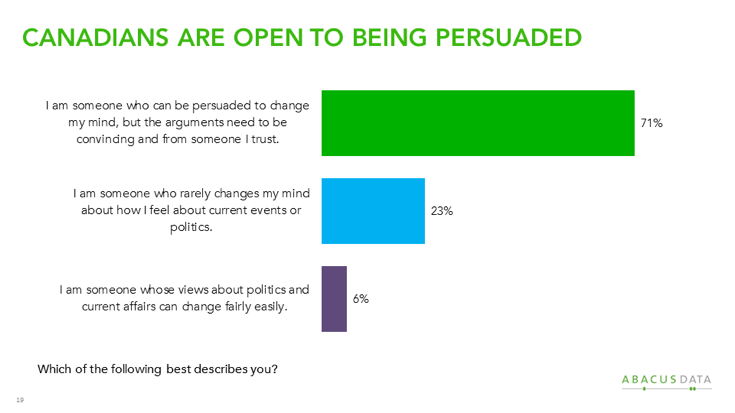 Most of us are open to persuasion even though we may hold specific views and opinions. While those who voted Conservative are somewhat less likely to be persuaded, a majority still say their opinions can change if arguments are persuasive and come from trusted sources. Young people are more likely to admit regularly discussing politics, though they are less likely to see themselves as someone who likes to share their views–those who could be valuable influencers. Influencers tend to be older and are almost evenly split between men and women. Most regularly check Facebook, discuss politics often, and like to keep up with a broad range of issues. They also consume far more news content than the non-influencers. They watch more TV news, listen to more all-news radio, and are more likely to read print newspapers. UPSHOT: Organizations can no longer boil the ocean with their outreach and advocacy efforts. They must be smart, creative and efficient. Being part of the considered opinion means funneling messages through trust networks based on personal and professional interests. They must tap into affinities and values rather than specific opinions. Public affairs strategists must also find, engage, and activate the influencers who are older and less engaged online. This suggests that a hybrid online/offline strategy is still essential to move opinion and shape policy choices in Ottawa, provincial capitals, and municipal councils. Critically, organizations cannot dismiss the role of websites and blogs in the digital ecosystem. As fake news and alternative facts give rise to disinformation, compelling and credible articles with verifiable facts, written to grab and keep attention and constructed with effective Search Engine Optimization (SEO), are necessary to ensure those who follow-up on stories they find on social media also find meaningful content. These are the hunters and gatherers of information who work hard to keep the record straight and will consider multiple sources in doing so. OBSERVATION: Canadians are just as likely to get breaking news and information via Twitter (5%) as they are from word of mouth (6%). Furthermore, 19% of Canadians check Twitter at least once per day. These Twitter users are evenly split between men and women, 67% are under the age of 45, and 76% voted in the last federal election. Given the nature of Twitter, it’s no surprise that these Canadians are twice as likely to use the internet to “tell people what they think” often and are twice as likely to get in “a squabble” with someone on the internet. 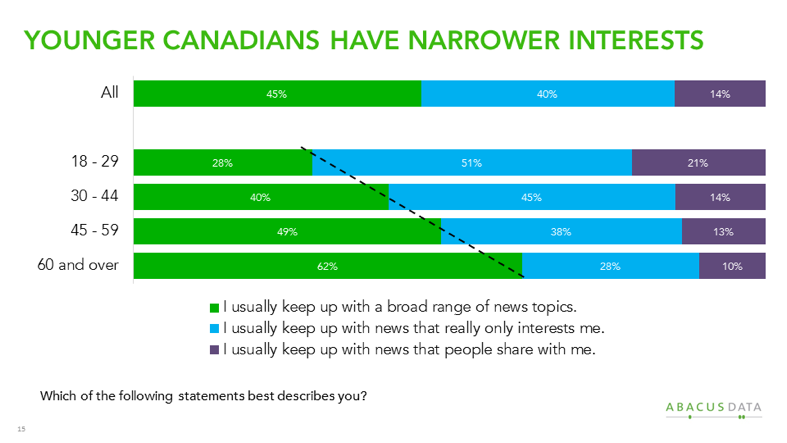 UPSHOT: Canadians are just as likely to tweet news and information as they are to talk about it in person with others. Twitter is a much more powerful amplifier and tweets are much more likely to appear on the radar of journalists which will help messages navigate their way to print and broadcast media. If organizations aren’t sharing their information and point of view on Twitter, they’d better hope somebody else is doing it for them. OBSERVATION: Canadians are using their smartphones and tablets a lot more, and desktops and laptops a lot less. 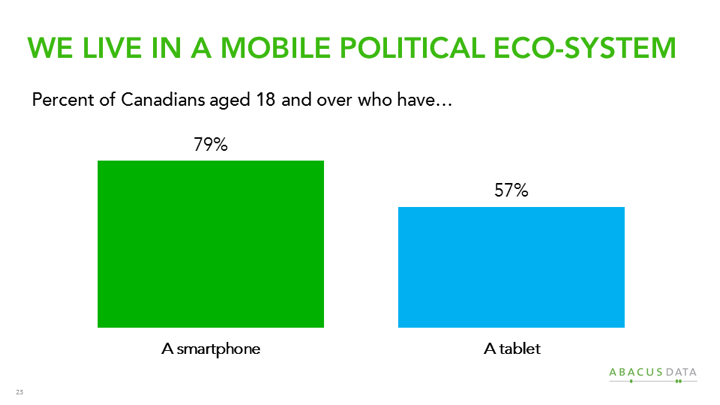 Four in five Canadians own a smartphone, and nearly three in five owns a tablet device. Moreover, 43% of Canadians say that they rely most on their mobile devices such as smart phones or tablets to access the internet and one in three Facebook users with a mobile device have the app on their permanent app bar. UPSHOT: Portability and convergence mean Canadians are increasingly carrying their smartphones wherever they go – work, home, errands, social events, vacations, concerts, rallies, etc. The result is they’re always a few “clicks” away from news and information as they engage in other activities. Organizations hoping to make an impact or harness support have no choice but to be accessible wherever, whenever and in a format and user experience that works well on a mobile screen. And our mobile connectedness means that organizations can reach consumers and citizens wherever they are. Facebook allows advertisers to target users as they enter specific geographic regions meaning you can target messages to those working around Parliament, provincial legislatures, and city halls. It has never been easier to deliver tailored messages to specific audiences on specific platforms. Furthermore, Canadians who receive information that concerns and/or inspires them want to act immediately in the most convenient way possible. Once you have their attention, organizations have only a few seconds to galvanize Canadians and get them to take action. OBSERVATION: A small group of hyper-connected, hyper-engaged Canadians can be instrumental in breaking the myopia-barrier. 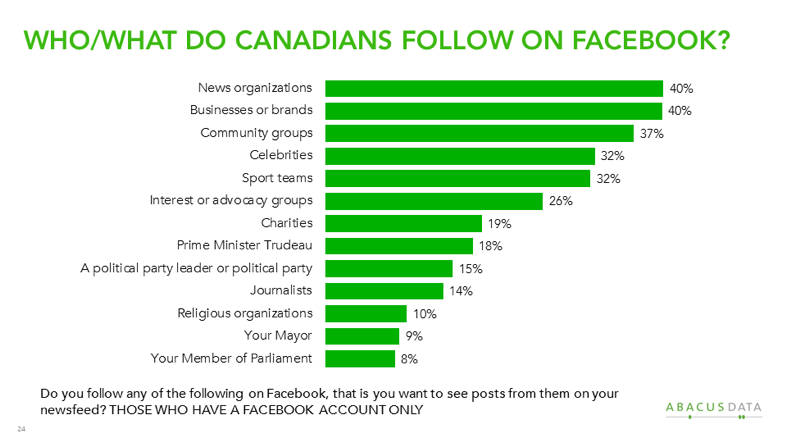 One-quarter of Canadian Facebook users follow interest and advocacy groups on the platform, 40% follow business and brands and 12% follow political leaders and organizations. Interestingly, one in five Canadian Facebook users report following Prime Minister Trudeau – nine points higher than their Mayor and 10-points higher than their MP. UPSHOT: Coupled with the sharing culture and the willingness of Canadians to change their minds based on good arguments from trusted people, it’s possible to tip the scales of public interest, opinion, and action. Organizations can harness those immediately connected to and interested in their activities to help reach a wider audience. Messages can be tailored to help them move through networks of networks based on common interests. Our survey was conducted online with 2,010 Canadians aged 18 and over from August 22 to 25, 2016. A random sample of panelists was invited to complete the survey from a large representative panel of over 500,000 Canadians. The Marketing Research and Intelligence Association policy limits statements about margins of sampling error for most online surveys. The margin of error for a comparable probability-based random sample of 2,010 is +/- 2.2%, 19 times out of 20. Full Duplex specializes in reputation and issues management, online advocacy, and analytics. Our ongoing research on the impact of digital and social media on Canadian public affairs and politics helps our clients achieve their goals with efficiency.